and it started scanning no problem. Thanks. The word got out before I had a chance to test the download/install. That problem is fixed in 0.9.8a. 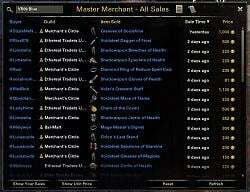 Could you put all the MM* folders under the MasterMerchant folder so as not to clutter the addons directory? Unfortunately I cannot. They have to be full add-ons to have a SaveVariables space, as far as I know. Last edited by Philgo68 : 02/12/15 at 09:58 PM. This add-on has totally changed the market for me. What use to take me forever now is a breeze. 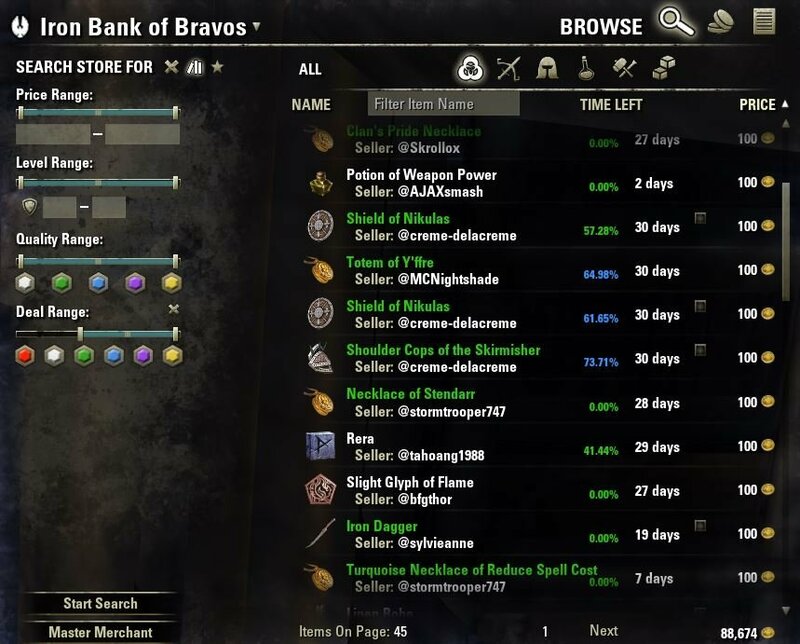 I actually have time to play the game instead of being consumed by trading. Thanks so much Philgo! nice!!! 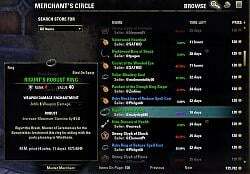 it will be compatible with GSA no GUI addon? Tony can read my mind! We just started talking about this. GSA no GUI contains an data miner that would be redundant (and maybe unnecessary) with this addon. 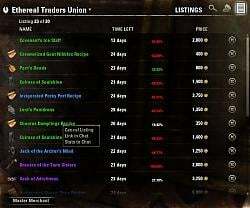 I haven't updated GSA no GUI for a while (my fault, i have been lazy) but it would be easy to bring it up to speed and depending on what Phil and I can work out there is a definite possibility of a GSA for Master Merchant or something similar. You know me, I will keep you posted on our progress. 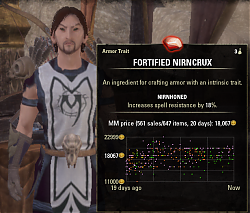 Thank You for really making this the premier version for sales data. On all the previous versions there was always some more sorting functions that I would have liked. 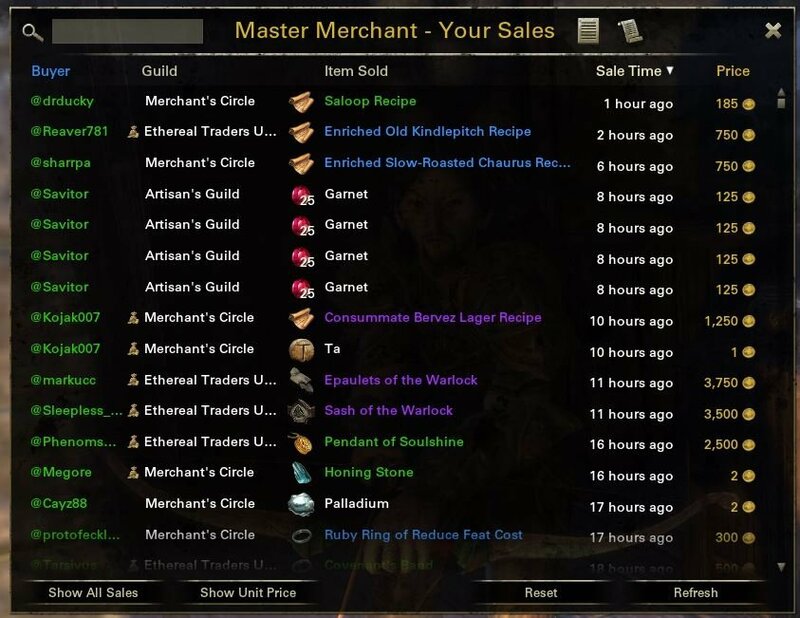 Is there any chance of an easy add to sorting the Guild and Item Sold columns on the Show Your Sales and Show All Sales windows? The search function is strong but only works off exact text, if I want to show only a specific item I have to search on the full exact name, and even then items like Kuta versus Rekuta will always return both items. 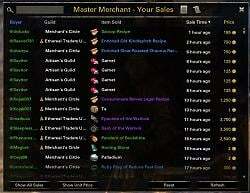 If I could at least then sort on Item Sold I could further arrange the data I'm using to make a sell-buy decision. 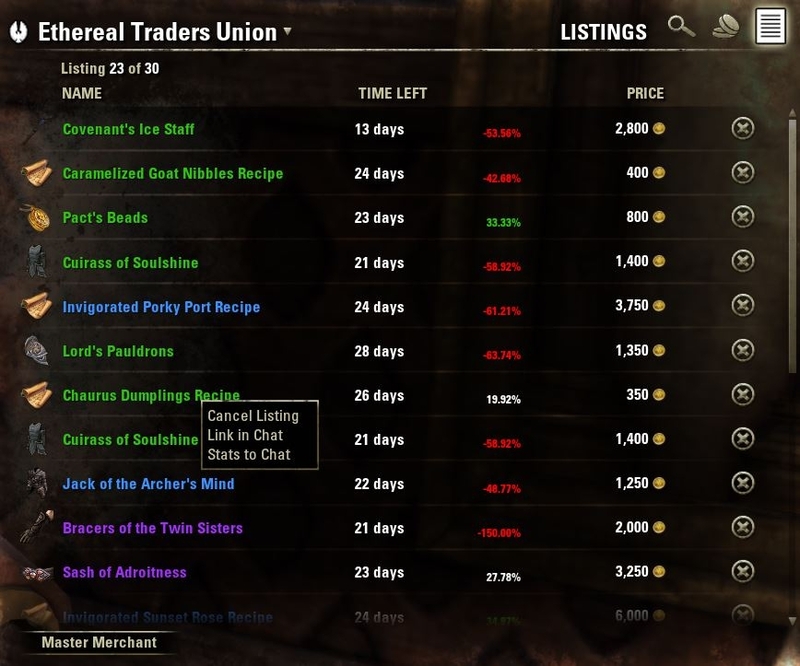 Being able to sort on Guild would also allow a first sort for an item and then a second sort for what it is in each particular guild and over a specific time and or price. 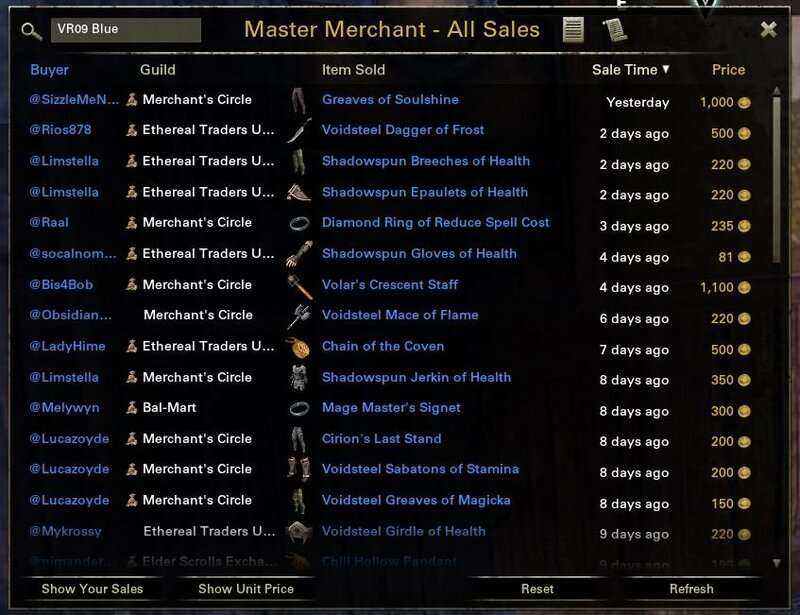 Since there isn't a multiple sort feature like [Item Sold + Sale Time + Price], just adding sort to those single columns would add a lot. 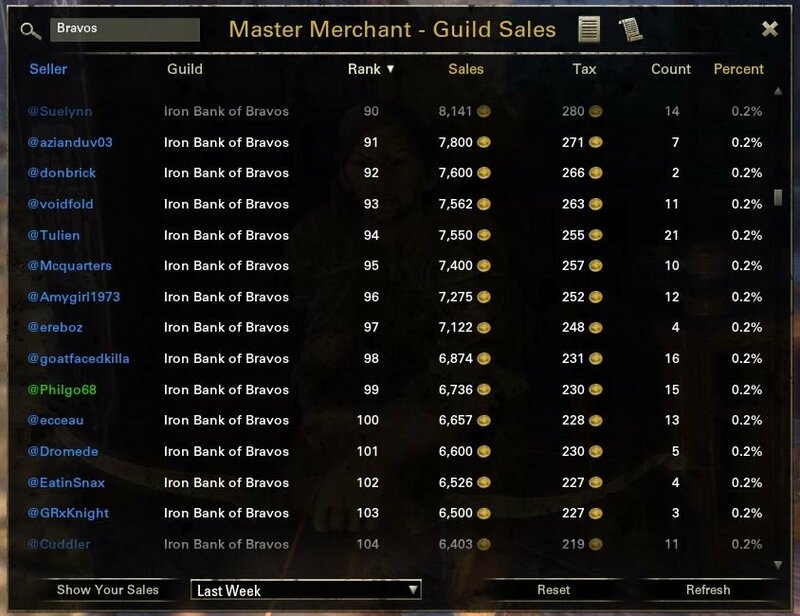 Finally, Trading Guild Officers and Members can see how Guild sales are performing and who the top contributors are! Thank you, PhilGo, for creating this Addon and most importantly, for releasing it for *anyone* to use instead of keeping it to yourself! Send this man presents! 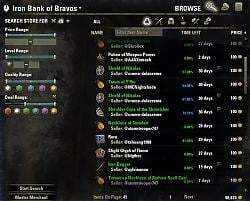 This add-on is great, the functionality is amazing and was needed in my opinion. I am having a slight issue with the add on after updating this morning. 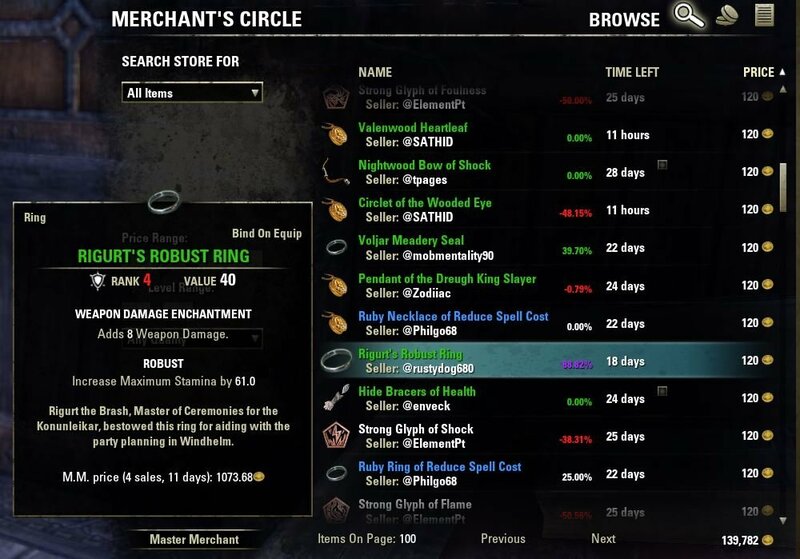 I can't "right click, use" an item from my inventory. I disabled all of my add ons and re-enabled them one at a time to narrow down the one that was giving me an issue. 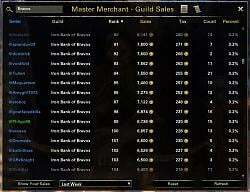 Unfortunately its Master Merchant. I can still hit "E" when hovered over an item to "use" it. Thanks for the feedback. I'll check that out. I added a right click / Stats to Chat option which might be the issue. Was the error something about "attempt to access a private function from insecure code"?